This collection consists of the Domestic Policy Council (DPC) records of Sarah Lucas, who worked for the DPC from 2000-2001 as both the DPC Office Manager and the Assistant Director of the Crime and Drug Policy team. 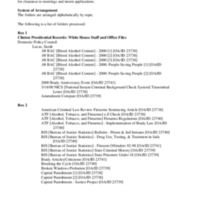 The collection consists primarily of published reports by various agencies including the Department of Justice's Bureau of Justice Statistics, Department of the Treasury, the General Accounting Office, and the FBI, among others. It also consists of publications, articles, press clippings, memorandums, talking points, background materials, letters, faxes, emails, and administrative materials like intern applications.